With over 4 million articles, Wikipedia is an invaluable resource, whether you’re throwing a term paper together at the last minute, or searching for juicy details about the Fritz Peterson-Mike Kekich wife swap. But follow enough links, and you get sucked into some seriously strange places. We explore some of Wikipedia’s oddities in our 4,483,535-week series, Wiki Wormhole. What it’s about: Opening Day is upon us again, and what better way to celebrate than by exploring one of baseball’s oddest traditions? When the New York Mets took the field at Shea Stadium in 1964, the lovable losers had an new face in the stands—the giant, baseball-shaped face of Mr. Met, baseball’s first costumed mascot. He spawned a trend that has consumed the sport, as all but three teams now have a mascot, an odd tradition that nonetheless has become as much a part of the game as around-the-horn and mandated drug testing. Strangest fact: The late, unlamented Montreal Expos were famous for being terrible, and their contribution to the mascot world is no exception. In 1978, they tried introducing Souki, a Mr. Met variation who, for reasons unknown, had antennae protruding at odd angles from his baseball-shaped head. He was famous for scaring children, and one fan even attacked the mascot for frightening his child. He was discontinued after one season, and replaced by Youppi!. Created by a Jim Henson puppeteer who also designed the Philly Phanatic, the shaggy, orange creature was a fan favorite, and remained popular until the team pulled up stakes and became the Washington Nationals in 2004. The Nats decided to replace Youppi! with Screech the Eagle, and after some heavy negotiations resulting in the world’s first cross-sport trade, Youppi! was sent to hockey’s Montreal Canadiens for a reported six-figure sum. Biggest controversy: Sadly, the page ignores baseball’s all-time greatest mascot controversy, the 1985 Pittsburgh Drug Trials, in which the Pirates’ parrot mascot was among several dealers arrested for selling cocaine to players all across the league. Far less criminal, but only slightly less crazy, was the San Francisco Giants’ attempt in 1984 to have an “anti-mascot.” Fans were encouraged to boo the team’s Crazy Crab, although some fans naturally took things too far, pelting the mascot with beer bottles, batteries and the like, until the team reinforced his costume with fiberglass. Giants and opposing players alike would pelt the Crab with rosin bags and other ephemera. Eventually, two Padres players tackled the Crab, injuring the performer inside. He sued, and the Crab did not return the following season. Thing we were happiest to learn: Baseball’s not the only sport being played in ballparks these days. 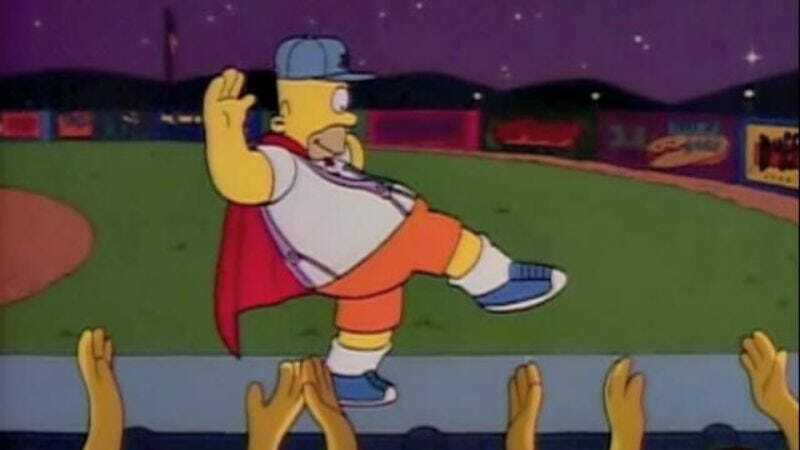 The Milwaukee Brewers began the tradition of “food racing,” in which mascots dressed up as food items have a foot race before the bottom of the sixth inning. The Brewers began The Sausage Race in the early ’90s to promote a local sausage company. Pittsburgh soon joined the action with racing pierogi, and over the years, various teams have added racing hot dogs, soft drinks, condiments, and, in Washington D.C., the four Mt. Rushmore presidents. Thing we were unhappiest to learn: Mascotting can be a dangerous business. The Crazy Crab is only one in a line of injured mascots. The New York Yankees have spent most of their long history without a mascot. One would-be embodiment of the team, Dandy, didn’t last through the 1980 season, as he was so unpopular he was beaten up by a gang of angry fans and quickly retired. The shortest-lived career, though, has to be the Texas Rangers’ Rootin’ Tootin’ Ranger, a Yosemite Sam-like character who fainted from heat exhaustion on his first day on the job and was never seen again. But strangest of all was the mascot killed off by his own team: General Admission, a cavalryman named for the cheap seats at the Houston Astrodome, cheered on the Astros for a few years in the 1990s, until the team’s main mascot, Orbit, “had him zapped by an alien ray gun” at the end of the 1999 season. Presumably lawyers were standing by to assure fans that his Poochie-like disappearance was legally binding. Also noteworthy: While Mr. Met was the first costumed mascot, they only truly grabbed the public’s imagination after the appearance of the San Diego Chicken. The Chicken began appearing at Padres games and other events around San Diego in the mid-’70s, and soon mascots started appearing in stands all over both leagues. But, despite his longtime association with the team’s fans, the San Diego Chicken is not affiliated with the Padres; he is simply an enthusiastic San Diegan. This didn’t stop The Sporting News from naming him one of the 20th century’s 100 most powerful people in sports. Best link to elsewhere on Wikipedia: Obviously links abound to every team in baseball, most of the stadiums, and in-depth profiles of some of the more prominent mascots on the list. And Wikipedia being Wikipedia, the page also feels the need to provide further information on confusing concepts like beer, mustaches, and hot dogs. But the most surprising link on the page is one for McCarthyism. When the anti-Communist witch hunts began in the 1950s, even baseball was affected, as the Cincinnati Reds briefly went by the less-suspicious Redlegs, and their Mr. Met-like mascot, Mr. Red, was blacklisted in favor of Mr. Redlegs, although during that pre-mascot era he didn’t appear in costume, only on the team’s logo. However, Redlegs began appearing in costume alongside Mr. Red in 2007, possibly to buttress the team against the specter of creeping socialism. Thanks, Obama!